Me and the Mormons. 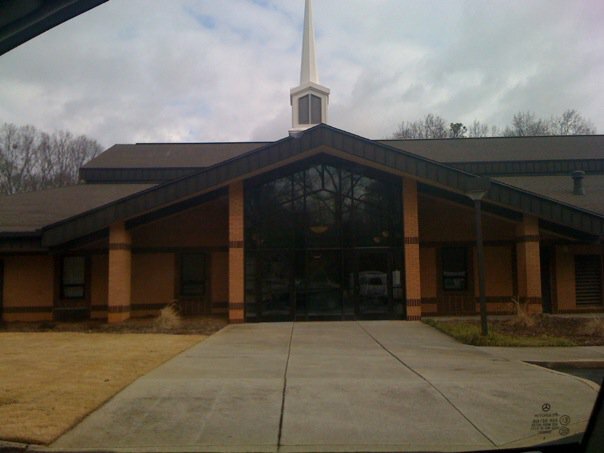 March 14, 2010: The Church of Jesus Christ of Latter-day Saints, Lost Mountain Ward, Powder Springs, GA. So, I was back in Atlanta to help my mother out with some house-related tasks. When Sunday rolled around, I knew that I needed to go to church with my family– but to fulfill my promise to myself, I also needed to go to a new church (Her church is Church of the Apostles, which I already visited in February.). I needed to find a church with an early service, and a shorter service, so I could go to that church first, then make my way to my mom’s church to attend a second service with my mother and my sisters. Yes, a bit of worship overload. Whaddya gonna do? So, basically I started googling around, looking for early and short services. Somehow, I was lead to consider the Church of the Latter Day Saints. My ignorance about Mormons was staggering. First, I needed to research whether I was allowed to attend a Mormon service without actually being a Mormon (Answer: a Mormon Church and a Mormon Temple are not the same thing. If a service is taking place in the Church everyone is welcome to attend. Church buildings are always open to the public, Temples are not.) I had to research terminology – I kept seeing information about specific “wards”, but didn’t know what that meant. After researching, I learned that a ward is the larger of two types of local congregations (the smaller being a branch). A ward is presided over by a bishop, who is the equivalent of a pastor in other religions. So, there it is there. Armed with all of this information, I located a ward near my mom’s house, and not far from her church, and I prepared for my Mormon experience. In preparing, I found myself dealing with a certain level of apprehension. I was faced with considering with the reality of a Mormon worship service vs. my perception. It is safe to say that there are a lot of ideas swirling out there about Mormons and what they believe; I had to push those aside. This idea of dealing with reality vs perception made me think about my home church, and all of the mayhem we went through during the 2008 elections – with people coming to service, “just to see what Trinity was all about.” I am sure that people came after seeing certain pastoral soundbites, with the intention of confirming their preconceptions, and others came with an open mind. I hope that both found that there was nothing evil going on. More about that later, I’m sure. With these thoughts in mind, I opened my mind as far as I could, and went to the service. It was the first time I was really nervous. I had had the chocolate chip experience before, but even with the strength of my research about Black Mormons, I felt like I would certainly stick out like a sore thumb, and wasn’t sure how I would be received. When I arrived at the service, a familiar thing happened – people smiled and did the “overzealous visitor greeting” since I was such an obvious visitor. I asked for directions to the sanctuary and everyone was very helpful. This put me at ease, sort of. I was as “at ease” as I was gonna get. At the service there were families there and many young people. The youth were a prominent part of the service, and announcements about socials for various segments of the community were made. The “Sermons” were interesting – there were members of the congregation who appeared to have been selected for what they called their “talks” –a young lady who talked about obedience, and her experiences trying to be obedient to God and the tenets of her belief, and then a married couple who spoke about obedience – first the wife, then the husband. Both were extremely nervous, and shared that the only reason they could make it through this public speaking opportunity was because they understood the importance of obedience. The woman shared her story of how she lost a child, which of course made me cry as I remembered the loss of my father. She cried, I cried. I was especially touched because she shared the story of how she joined the church as a young teenage girl, despite the fact that her friends didn’t really agree with her choice. She also shared the story her and her now husband –and how she told him that if he did not join the church that they had no future. Now some might find that primitive or extreme, but I was touched by her depth of conviction, and contemplated the sense of self worth that someone must have to approach an intended partner and say, “This is what I need, can you get with the program?” This is something that has always been especially difficult for me – to figure out how to be fully myself while trying to accommodate someone that I love, and I welcomed the opportunity to hear someone state that this was part of their process – and that the result was a union that took place within the church that she had come to love and commit herself to at such a young age. The man, who was the husband of the first speaker, was so nervous, he started to cry. Alot. I can’t say he was the most prolific speaker, but what was clear was that he loved the church, he loved his wife, and he loved his family, and that was good enough for me. Like: “Daddy, when we get to Heaven, can I taste the Milky Way? “Are we goin’ there to visit, or are we goin’ there to stay? “Am I gonna see my Grandpa? Can I have a pair of wings? As I listened to the lyrics, and contemplated the thought that when I get to heaven I might see my father and my grandmother again, the tears started to flow again. The lyrics also touched the man giving his “Talk” – he choked through it, likely thinking about the loss of his child, and then sat down. There were references throughout the service to the book of Mormon – many religions seem to have its own “last” prophet or messenger, and I am woefully ignorant about so many of them. I don’t think I know enough about the prophets within my own religious tradition, including Jesus, and precious less about any other “most recent” prophets or books, etc. There is so much to learn — and to learn not just from an academic perspective, but from a heart perspective. It is precisely this that is the reason this project was not a “religious shopping expedition” for me – I am happy worshipping within my religious tradition. I have miles to go before I understand the heart of Jesus and what he has in store for me. I will happily continue down my path of enlightenment…but that did not prevent me from wholeheartedly investigating other worship traditions with an open mind and an open heart. I don’t see a contradiction at all. As the service continued and the “Talks” concluded, there was a portion of the service dedicated to giving the sacrament. This was communion, essentially, and as I had committed to respecting other’s sacred rituals, I did not take it. In this case, I was curious; however, as in communions that I had in the past, there was bread and wine/grape juice. In this case, there was bread, but the accompanying liquid was clear, and I really wanted to know if it was water or something else (vodka? ), but let it pass by me so as to be respectful. Later I googled this and found out that the liquid was water, as Mormon’s don’t drink alcohol. I of course did not know this when the Sacrament meeting began. I found out when, after the Sacrament meeting, I was talking to a young lady who was drawn to me I obviously stood out and I was being greeted as a visitor. She told me about the three part program and invited me to come to the Sunday school. This was a challenge as I had planned to meet my family at my mom’s church which I had already visited early in the year. But I wanted to have as authentic a Mormon experience as I could given my time constraints, so I went to the small group. There it was even more evident that I was a visitor, so much so that the Sunday school instructor had my brand new friend introduce me to the group, God bless her. She didn’t even know me and told everyone that I googled them and that is how I found them. Well, that sounded a little silly, I thought, but it was the truth and they say the truth will set you free, right? Anyway, I thanked everyone for having me and the lesson commenced. The topic for discussion was “Marriage in the Covenant” which actually made me feel like there was some level of synchronicity about the topic for the day. As a single woman in her 30s, lately I have been seeking any advice to help me determine if, when and why I might be married, and if I do approach matrimony, what would it look like? This joke made me think, especially as I have become quite the student of myself in the wake of the loss of a relationship that I thought might be the one. I tucked that lesson away and kept listening. And that is where things progressed from here to, um, whoa dude. The story was from Genesis 24 – where Abraham is looking for a wife for his son. –and he is looking for a wife who is “within the covenant.” The teacher asked a question about what that meant…and instead of being silent and observing like I should, I gave my two cents. She was kind and gracious and told me that I had a good point, but I realized, almost as soon as I opened my mouth, that it wasn’t for me to talk because I had no idea what I was talking about. This was a small group session discussing the concept of marriage within a specific faith tradition – and one that I knew nothing about. I wasn’t sure what “in the covenant” meant, but I was pretty sure it didn’t mean me. I didn’t know how to really contribute to a discussion encouraging only people to marry people who were “within the covenant,” or only from their own community but I was pretty sure it meant that none of young single men in the congregation should consider marrying me. But I learned a valuable lesson about how I needed to continue to conduct this experiment – be humble, shut up and listen. I had much to learn. « Where should I worship this weekend? General conference happens twice a year April and October in Salt Lake City. If you were ever to visit a general conference I would like to read an article of what you think of it. Here is another link to a talk that was recently given http://lds.org/general-conference/2011/04/an-ensign-to-the-nations?lang=eng and might give you a little insight of what general conference is about. Welcome! And thanks for stopping by. Glad to hear Karen shared my site with you – she has been a good friend of mine for many years. It is funny, I guess, that what I thought would be an hour long Mormon service, ended up being a 3 part project! Although I discovered over my 52-week journey that 2 hrs is my worship timing cutoff, I enjoyed my time at the LDS church, as it encouraged me to really be quiet and listen more intentionally as I visited different sacred spaces. A valuable lesson. Stop by anytime, I look forward to hearing your thoughts as the community grows. Happy New Year!